ITPO, the premier trade promotion agency of the Ministry of Commerce & Industry, Govt. of India is organizing 33rd edition of the popular India International Trade Fair (IITF) is scheduled from November 14-27, 2013 at Pragati Maidan, New Delhi. IITF is the largest integrated trade fair with B2B & B2C components. It has emerged as the largest consumer goods fair in the Indian sub-continent and is one of the largest trade fairs in the world both in terms of exhibitor and visitor participation. The format of IITF has Business, social, cultural and educational dimensions that are weaved together where visitors and exhibitors, media persons, marketing professionals, social activists, NGO’s, come together to explore their objectives. A number of government organizations use this platform to spread awareness about their programs and policies among the public. As such almost all States and Union Territories of the Federal Government of India Participate in this event. India’s iconic annual event focusing on B2B & B2C. The first five days of the fair (Nov 14-18) will be reserved for business visitors. The fair opens for the general public from Nov 19-27. Over 6,000 exhibitors to showcase at India International Trade Fair (IITF) from all over the world. Participation of India’s all 32 States and Union Territories. 250 Overseas Exhibitors from 21 countries (230 in national pavilion and about 20 exhibiting independently). 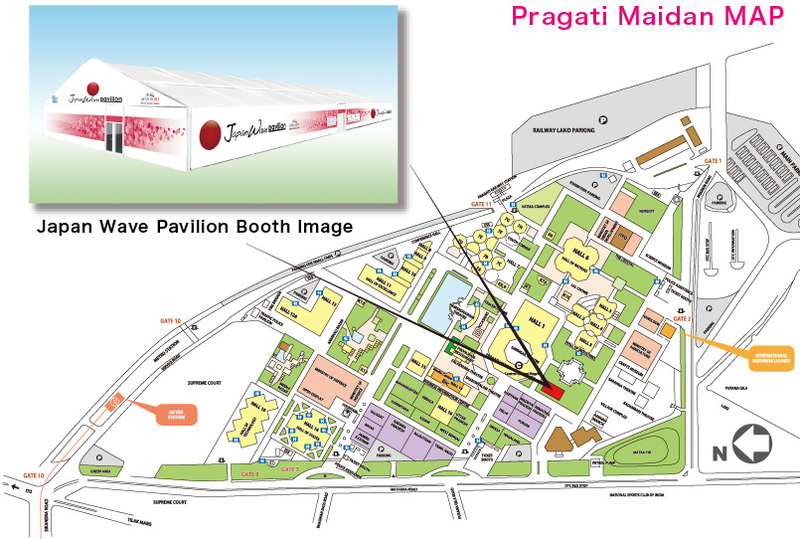 Over 3.5million visitors expected during 14-day event at Pragati Maidan. Japan is participating as Partner Country for the First Time. South Africa is participating as a Focus country. Hon'ble President Mr. Pranab Mukherjee will inaugurate IITF on 14th November 2013. Ministerial VVIPs of Japan and South Africa will be seated on the Dias. The Ministry of Economy, Trade and Industry (METI) along with the Japan India Industry Promotion Association (NPO) is hosting the Japan Wave Pavilion at the 33rd India International Trade Fair, which will take place from November 14 to 27, 2013 at Pragati Maidan, New Delhi. Japan occupies a special place at the IITF 2013 as the Partner Country. As part of the Cool Japan strategy, METI will hold the Cool Japan World Trial Project in India. At present, the Government of Japan, especially the Ministry of Economy, Trade and Industry (METI),is promoting the growth of fledgling Cool Japan businesses (regional speciality products, foods & beverages, handicrafts, tourism, contents, etc. - hereafter, ‘Cool Japan Merchandise’) located in the nation’s regions with the aim of stimulating Japan’s economy through the encouragement of a new and thriving creative sector. This business aims to seize demand from each individual country by creating opportunities for networking exchange with local companies and is actively engaged in hosting presentations of the goods and services of Japanese companies in the Republic of India and five other foreign countries. By establishing the JAPAN Wave Pavilion in India in cooperation with IITF, we shall be able to introduce the excellent Cool Japan Merchandise of Japan to the giant Indian market. India has been drawing attention as a new investment and business target. Therefore, this trade fair has gained a lot of attention domestically and overseas. This is a vital business negotiation opportunity for companies that want to start business transactions with India and for companies that already have business relations with India. In addition, many companies in India that are looking for business transactions overseas will participle and have exhibitions. In the past, many business deals were struck during this fair. In addition to “B to B” business deals, as a “B to C” exhibition, more than 3 million visitors will come, and a wide range of people including businessmen, families, and students on school trips will visit from not only Delhi, but also from neighboring regions such as Haryana, Rajasthan, Uttar Pradesh, Punjab, and Himachal Pradesh. It is an event where you can feel the air of excitement in immense India. Please do take the opportunity to drop by the Japan Wave Pavilion during your visit to the IITF. 800 m2, (all of exhibition Hall 21), the largest-ever scale for a partner country. 2) Corporate booths Number of exhibiting organizations : Around 30 Main products exhibited: Automobiles, motorcycles, electrical appliances, electronic products, Home Appliances, Green Tea, Education, LED Lights, office equipment, tools, Apparel, Animations, Pop Music, etc. Dempagumi.inc is a Japanese idol group, composed of six girls, Mirin Furukawa, Risa Aizawa, Nemu Yumemi, Eimi Naruse, Ayane Fujisaki, and Moga Mogami. Each one has been assigned a color. The group belongs to Dear Stage, Akihabara’s most famous idol live house and bar where they perform regularly. All of the members are geeks/otaku of anime, manga, games, or costumes. The group has performed at Tokyo Collection and has also collaborated with several leading fashion designers including Mikio Sakabe. Over the last few years, Akihabara’s Dempagumi.inc has been a rising star in the current idol market, moving up from their small beginnings at a local cafe, Dear Stage, to the point where they are now able to perform at international venues and are gathering devoted fans all over the world. The group has quickly become one of the most exciting, important, and endearing idol groups in the industry today. They attract attention overseas as well and have performed at fashion events in Jakarta and solo concerts in Taipei. Tickets for their solo concert at Zepp Tokyo and Hibiya Yagai Ongakudo sold out fast. The unit recently released their latest single, 'W.W.D2' and hit 3rd on the Music Chart. The group has now signed for a new record label, MEME TOKYO, and they are produced by TOY'S FACTORY and Mofuku-chan. TWith a musical style straight out of Akiba, Dempagumi.inc is set to take the India International Trade Fair (IITF) main stage by storm! Dempagumi.inc is a Japanese idol group, composed of six girls, Mirin Furukawa, Risa Aizawa, Nemu Yumemi, Eimi Naruse, Ayane Fujisaki, and Moga Mogami. With a musical style straight out of Akiba, Dempagumi.inc is set to take the India International Trade Fair (IITF) main stage by storm! Hiromitsu Agatsuma is a famous shamisen artist. Agatsuma is breaking new ground with his fresh approach to the shamisen and is introducing this traditional instrument to new listeners everywhere. Hiromitsu Agatsuma, a famous shamisen artist, will be performing live at Hamsdhawani Theatre, Pragati Maidan at IITF 2013 on November 14, for his first appearance in India. Agatsuma is breaking new ground with his fresh approach to the shamisen and is introducing this traditional instrument to new listeners everywhere. Agatsuma started playing the Tsugaru-shamisen when he was six years old. He won numerous music competitions in his youth, which brought him a lot of attention on the traditional Japanese music scene. Aside from burnishing his reputation, he was also passionate about pushing the boundaries of his art and has often collaborated with jazz and rock musicians. He made his CD debut with the release of “AGATSUMA” in 2001. Both this first release and his sixth album “○－en” won the prestigious "Japan Gold Disk Award” – an honor awarded to the artist achieving the largest record sales for the year. He has also collaborated with musicians abroad including Marcus Miller and Herbie Hancock among many others. He has also played acoustic concerts concentrating solely on folk music, and given acoustic live sets in the classrooms of elementary schools all over Japan. He tirelessly pursues both tradition and innovation for the Tsugaru-shamisen in all his performances. NPO JIIPA since 2013-08-05 / Copyright 2010 NPO JIIPA. All Rights Reserved.